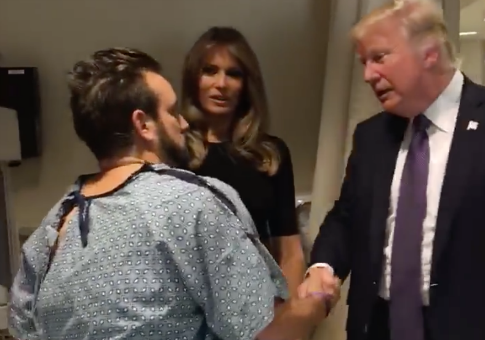 Las Vegas shooting survivor Thomas Gunderson was shot in the leg during Sunday night's attack, but he still stood to greet the president and first lady when they visited him at the hospital. President Donald Trump and First Lady Melania Trump visited Last Vegas on Wednesday to speak with doctors, law enforcement officers, first responders, and survivors of the deadliest mass shooting in U.S. history. With over 500 people injured in the attack, the Trumps visited one of the hospitals where survivors are recovering. Gunderson was one of the many people who sustained injuries from being shot and spoke with the president and first lady during their trip. Gunderson, despite being shot in the leg, stood when he shook the Trumps' hands and later posted a video of the interaction to his Facebook page. The video went viral almost instantly, the Hill reported. "Don't get up," Melanie Trump said after entering the hospital room. "Are you OK?" "Hey, this guy looks tough to me," President Trump said as he entered Gunderson's room after the first lady. This entry was posted in Politics and tagged Donald Trump, Facebook, Guns, Las Vegas, Melania Trump. Bookmark the permalink.